As such, there’s surprisingly little quantitative research on the topic, perhaps due to innovation often being difficult to measure. While we’ve written quite extensively about innovation management in the past, we haven’t gone into much detail on the more quantitative aspects of the topic yet, even though we often get asked for all kinds of numbers and statistics regarding both our clients, as well as the industry in general. There isn’t unfortunately much of the prior that we could share due to confidentiality. However, we are more than happy to share our thoughts on the latter in the form of this post. There’s quite a bit of data that we’re going to go through in this article, so we’ve broken the most interesting findings from more than 20 studies down into a number of different areas and then combined the most interesting findings into an infographic, which you are free to share as you wish. According to McKinsey, 80% of executives think their current business models are at risk to be disrupted in the near future. In addition, 84% of executives say that innovation is important to their growth strategy. 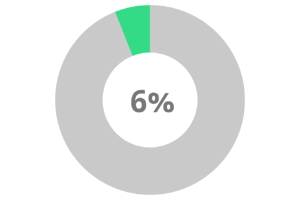 The Accenture 2015 US Innovation Survey tells a similar story: 84% of executives considered their future success to be very or extremely dependent on innovation. Even back in 2010 the McKinsey Global Survey revealed that only 4% of executives have not defined innovation as a strategic priority and have no plans to do so in the future. Innovation clearly seems on the strategic agenda of most large organizations, which makes sense as it would seem to be the leading cause of economic growth over the long term according to a number of sources, such as the OECD report on Innovation and Growth. In addition, Booz & Co. (now Strategy&) 2011 Global Innovation 1000 report found a clear difference in both revenue (11%) and EBITDA (22%) growth in favor of the more innovative organizations. Innovation sometimes has a bad reputation among executives and board members who’ve been burned by unsuccessful innovation initiatives in the past. 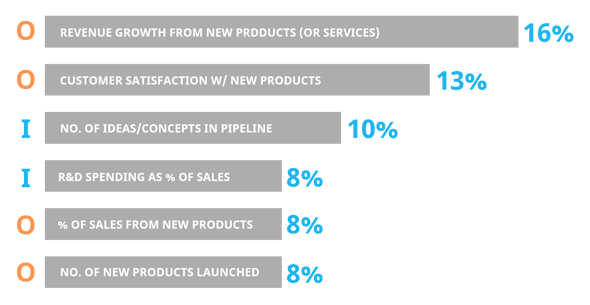 However, as the numbers show, innovative companies grow faster and more profitably than the rest. As the numbers show, innovative companies grow faster and more profitably than the rest. While innovation is crucial for the long-term performance of any organization, it’s especially important for large corporations looking to grow – or even looking to keep their current market position – with half of the S&P 500 forecasted to be replaced in the next ten years. And most organizations already understand this. If your organization doesn’t have innovation among your strategic priorities, you might want to revisit your rationale for doing so. Innovation is, without a doubt, challenging. According to HBS professor Clayton Christensen, 95% of all product innovations fail, and according to the Startup Genome report, 92% of startups fail. While the accuracy of the previous numbers can be debated, according to the aforementioned McKinsey Global Innovation Survey, only 6% of executives are satisfied with their innovation performance. What’s more, according to the 2017 PwC Innovation Benchmark, 54% of innovating organizations have trouble bridging the gap between innovation strategy and the larger business strategy. As such, it’s quite safe to assume that there’s plenty of room for improvement when it comes to innovation. The interesting part is figuring out why that is the case. While we’ve heard talk about R&D investment driving innovation on both the micro and macro-economic levels, there would seem to be more to the puzzle than simply throwing cash at the problem. For example, based on both the 2017 PwC Innovation Benchmark and the 2011 Global Innovation 1000 reports mentioned earlier, the best innovators aren’t usually the ones with the biggest R&D budgets. According to the BCG 2015 Global Innovation Survey, the top 6 obstacles for innovation performance would seem to be mostly related to choosing and executing the best ideas, but also to a certain extent, the company culture. When combined with the fact that, according to the Deloitte 2016 Global Board Survey, the areas where the board of director’s understanding is weakest are talent management and innovation/R&D strategy, it would seem quite likely that the root cause for the challenges in many organizations could be at the very top. Very similar results were also found in the SpencerStuart 2016 Global Board of Directors Survey. The board of director’s overall understanding of company strategy is the weakest with regard to talent management and innovation/R&D strategy. The 2015 Accenture Survey we mentioned earlier found 82% of organizations to run innovation in exactly the same way as they would go about achieving any incremental performance gain in their regular operations. This seemed to lead to quite a few different challenges, such as 72% admitting to missing crucial growth opportunities and 60% struggling to learn from past mistakes. To succeed in innovation, an organization has to get a lot of things right. They have to be good at coming up with new ideas, evaluating and choosing ideas, as well as developing and commercializing those ideas. And to top it all off, they need to fit all of that within the context of the organization, meaning sources of competitive advantage, the available resources and chosen strategy. To succeed in innovation, an organization has to get a lot of different things right. Many of these areas require capabilities and expertise that are very different from both one another, but especially from the core operations of the organization, which poses interesting challenges for the leaders. In the end, it’s always the responsibility of the leadership to make sure that their plans, in this case related to innovation, are successfully executed. Thus, boards that are serious about innovation should put emphasis on understanding these issues and in putting the right people in charge. As we discussed in the last chapter, innovation is tough, and many organizations seem to have a hard time in figuring it out. No credible research that we’ve seen has found a single “silver bullet” that would solve the puzzle, instead organizations have to get a lot of things right at once to succeed in innovation. As was discussed in the October 2008 issue of the McKinsey Quarterly on the results of a McKinsey Global Survey, the best performing innovators were more likely to measure the whole innovation process as opposed to just the end results, and also had chosen metrics that allowed them to use the metrics for assessing and improving the way they innovate. In their 2011 Global Innovation 1000 report, Booz & Co. identified that 60% of the top 10 global innovators were “Need Seekers”, or organizations that focused on engaging customers and on being the first to market, very much in line with the “Lean Startup” and “Jobs to be Done” schools of thought. The other innovator archetypes they identified were “Market Readers” and “Tech Drivers”. They are more focused on external trends, such as market trends like wearable devices and emerging technologies like blockchain respectively. They identified 30% of Need Seekers to have highly aligned business and innovation strategies compared to only 8% for the other two. In addition, 41% of Need Seekers were reported to have very pro-innovation cultures, as opposed to an average of 10% for the other two. The same 2011 Booz & Co. study also investigated the effects of having a highly aligned innovation strategy (with the overall business strategy) and pro-innovation culture on the growth of the enterprise’s value and reported a 30% improvement over organizations that didn’t possess both. Organizations with both highly aligned business & innovation strategies, as well as a pro-innovation culture, have 30% higher growth on their enterprise's value. While not terribly surprising, it’s quite evident that the small portion of organizations that are able to master both of these qualities are best equipped for long-term success, in large part thanks to their innovation capabilities. The October 2008 McKinsey Quarterly article also identified that the best performing innovators weren’t just measuring the whole innovation process, they were far more likely to use metrics to look at the entire innovation portfolio and to seek to find the right portfolio balance for their specific goals. In addition, while it’s harder to gather comprehensive data on innovation initiatives across large companies, there’s much more data regarding the success of Venture Capital investments in startups. While there are differences between the two, both are after the same goal: finding ways to use innovation to create shareholder value. Venture Capital firms have long taken a portfolio approach to this problem. They know that the vast majority of startups will fail, so they need to get outsized returns for the ones that do succeed to drive the overall value of the portfolio. And there’s data to prove this point. As Alexander Osterwalder, the creator of the Business Model Canvas, recently wrote, large organization need to learn that when it comes to innovative initiatives, it’s usually impossible to pick the big winners from the losers early on. This simply means that for an organization to drive significant long-term growth, they need to invest in a large number of innovation initiatives, and fail in most of them, to be able to find the few that pay for the rest – with interest. 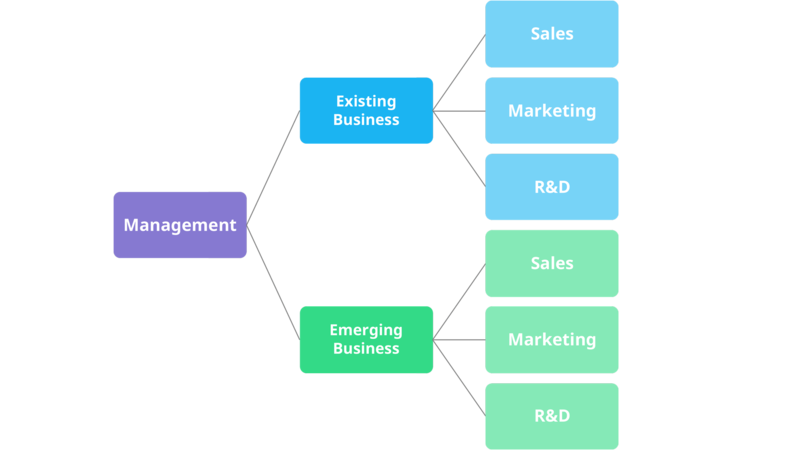 Ambidextrous organizations are organizations that have structurally different teams for existing and emerging businesses, both of which are, however, linked to the existing management hierarchy. 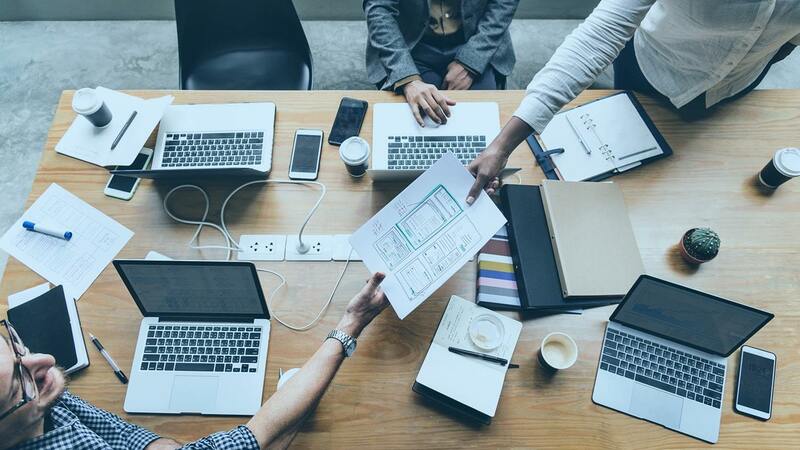 According to research led by HBS professor Michael Tushman, ambidextrous organizations succeeded in breakthrough innovation 90% of the time, whereas any other type of organization didn’t succeed at a rate above 25%. While the sample size was small, there is also other supporting evidence for the usefulness of this approach. 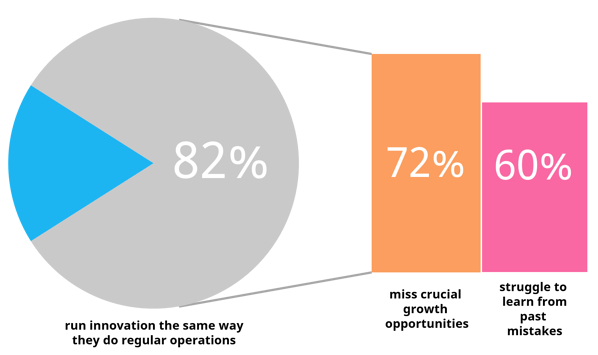 For instance, the 2017 BCG Global Innovation Survey identified that the best innovators used this kind of an organizational structure 77% of the time, whereas the weak innovators did so only an average of 25% of the time. The difference between the two groups was almost exactly the same also in terms of using different KPIs and different processes for what the study refers to as “radical” innovation. The same BCG 2017 survey also found open collaboration to be a significant factor separating the best from the rest, the best reported to be supporting open collaboration 77% of the time, compared to just 23% for the not so strong performers. In this context, “open” meant having organizational structures that allowed for easy collaboration with both internal and external partners. 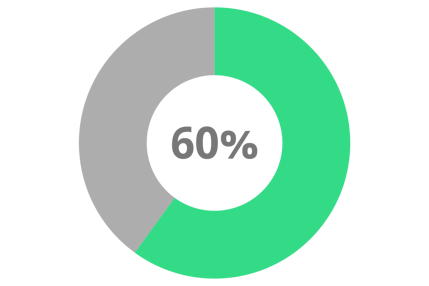 Another finding from the BCG 2017 survey was that best performers rarely based project approval on future revenues. They did so only 22% of the time, compared to the 75% of the weaker innovators. The best innovators rarely based project approval on future revenues, whereas the rest usually did. The October 2008 McKinsey Quarterly article speaks the same language: the best performers were less likely (29% vs. 37%) to base innovation spending on the relative attractiveness, or business case estimates, of individual projects and approached the topic more from the point-of-view of the entire portfolio. It’s evident that innovation is quite a complex beast. The 2017 BCG survey states that the top performers have simultaneously nailed at least a dozen different success factors related to governance, management and organizational structure, the most significant of which we presented above. What’s more, even the best innovators don’t usually know which projects are going to be the big winners, so they aren’t putting all of their efforts into trying to do so. Even the best innovators don’t usually know which projects are going to be the big winners. They’re simply looking to give innovation the best possible chance of happening by making sure that their innovation work is aligned with their strategy and that their organization and processes support, not inhibit, that work. Measuring innovation is another part of the puzzle that isn’t without its own challenges. While 71% of executives (according to the McKinsey Quarterly October 2008 article) claim to be satisfied with the innovation metrics they are using, they don’t seem to be able to use the metrics for anything. When asked if the used innovation metrics enabled them to use data for actionable purposes, such as for improving overall innovation performance or assessing their progress against goals, no more than 32% reported themselves to be capable of any single one of these, let alone all of them. 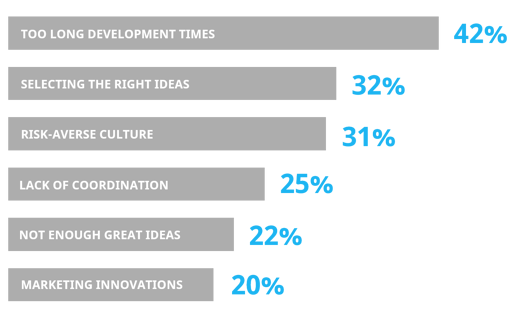 According to the survey, the average organization uses 8 separate metrics to measure innovation. 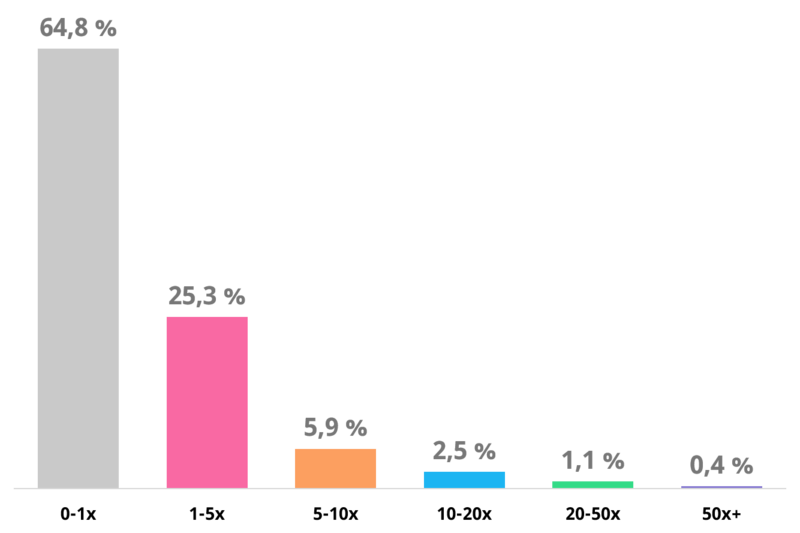 The chart below showcases the innovations metrics that the organizations in the same study found to be of the most importance ordered by frequency. What’s interesting here is that the organizations seem to, in general, prefer quite simple output metrics (labeled with "O" in the image) over input metrics (labeled with "I" in the image) or performance metrics, such as time to market or process efficiency, which could be an important factor explaining the actionability gap. The high satisfaction rate for innovation metrics combined with the very low scores for actionability of said metrics together with the very low satisfaction rate for innovation in general would point to many organizations using vanity metrics to measure innovation. While some of the most widely used metrics are effective for looking at the big picture, you do also need to measure and monitor things that actually help you improve performance. 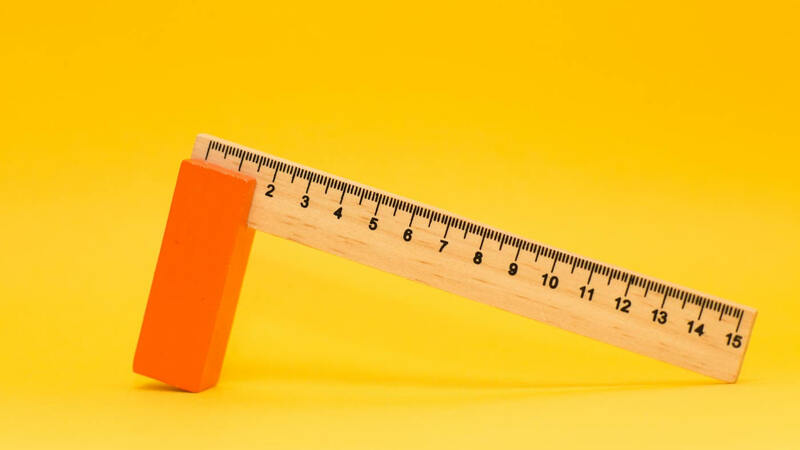 So, make sure that the set of metrics you’re using to measure innovation is designed to be actionable and to help you actively get better at your innovation work, not just to tell you where you are. 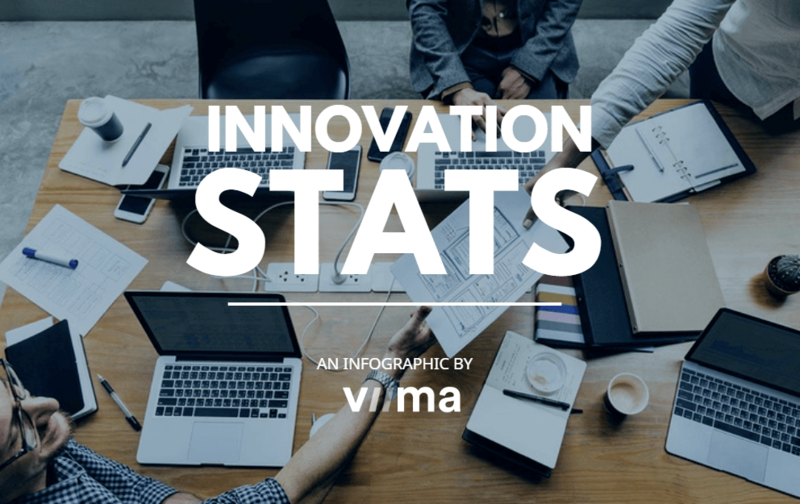 We hope you’ll find these numbers useful in shedding some light on some of the more common themes and challenges related to innovation management. You can get an overview of these numbers in a more visual format by downloading the infographic that we’ve created based on them by clicking on the button below. If you’d like to read more actionable tips and tricks on innovation management, make sure to read some of our other posts on the topic.